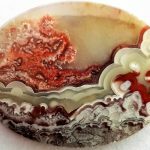 Leith Lapidary Club provides a pleasant and well-equipped studio for members to work on their own projects involving lapidary and enamelling as well as small-scale metalwork with silver and copper. We have a range of equipment and tools available for our members use and a limited supply of materials are available at cost. 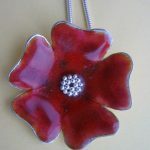 We also regularly organise a variety of weekend tutor-led workshops from beginner level upwards in enamelling, silver jewellery and lapidary. Workshops are open both to members and non-members of the club. The club room is located on level B2 of St Margaret’s House, a large Arts Complex with some shared facilities and other artists to interact with. 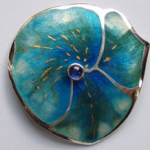 Our Open Day is coming up on Saturday 27th April 2019 from 11am to 6pm so you are warmly invited to visit the studio to find out more about lapidary or even have a go at enamelling. There’ll be members on hand to show you around and answer any questions as well as work on display and for sale, not to mention the lovely cakes and home baking. Why not come along and find out for yourself!